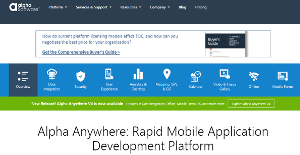 Alpha Anywhere is a comprehensive mobile app development platform that enables businesses to create business applications that are tailored to the mobile environment, their existing workflows, and other requirements. Business users and IT developers can work in parallel to build apps faster and avoid bottlenecks encountered in traditional business app development processes. The software aims to speed up their processes, enhance productivity and efficiency without sacrificing quality of work and accuracy. With Alpha Anywhere, users can build applications without having to be technically proficient in codes and computer languages. It allows users to create custom applications from a unified platform, instead of having to create apps from the scratch using various platforms and languages. Alpha Anywhere is basically a powerful mobile app development platform that lets you create apps from the ground up using a single, centralized system, thus saving you time that you can channel elsewhere. Alpha Anywhere has a unique development and deployment environment with a distinct “no-code” or “low-code” component for mobile and web apps. The Alpha TransForm – available on iOS and Android app stores – is designed for business users and developers to transform forms into a mobile app using a smartphone. This standalone service also has a built-in programming language for power users to maximize advanced app functionality. Meanwhile, Alpha Anywhere’s low-code environment can be used by IT developers for developing mobile and web apps. Users can protect corporate data by adding security and authentication measures. Integrating with existing systems is also available to connect your workflows, records, and data collected from Alpha TransForm. Creating mobile business applications the traditional way can be time-intensive and demands various skills sets. And if you decide to have a third-party app developer work on custom mobile applications, it can cost your company a lot of money. Instead of taking days and weeks, anyone in can build and develop enterprise-grade, data capture-based mobile apps in an average of 20 to 30 minutes using the Alpha Anywhere’s no-code capability. Alpha Anywhere changes all that by providing companies with a straightforward and intuitive mobile business application development platform that simplifies and accelerates the whole app development process without having tons of coding and development expertise. It is a unified solution that enables users to build mobile applications that are specifically customized for specific tasks and processes and capable of running smoothly across devices and operating systems and integrate with existing applications and workflows. Unlike the majority of mobile app development platforms out there, Alpha Anywhere integrates all the necessary required client and server development features. The software is designed to help you address both front-end and back-end aspects of the development of an application. With Alpha Anywhere, creating apps become faster, beating traditional coding by a mile. There is no need to write and debug lines. With its RMAD (Rapid Mobile App Development) capability, Alpha Anywhere lets you create custom applications visually while it takes care of the code writing part. And if you need to specify with your application, you can drill down and integrate your own code without any fuss. What Problems Will Alpha Anywhere Solve? An offshore oil drilling company was in need of a solution to capture and monitor the maintenance of its facilities in the North Sea. The extreme and harsh conditions in which the facilities operate made it difficult for the company to capture maintenance data without strong and stable Internet connectivity. With Alpha Anywhere, the company was able to create a mobile app designed for tablets and smartphones that would enable workers on the oil platform to document critical data, photos, and signatures offline, and then update a Microsoft Access backend database directly allowing them to accurately track their key inspection and maintenance data. A local municipality was using more or less 80 apps to perform several functions for over 20 county departments which include building permits and renewals, certificates of occupancy, real-estate tax collection, repossessing property, and others. These applications are used by multiple audiences and are all over the place, which can be confusing and impede the running and managing operations and functions. Alpha Anywhere enabled them to build a new app to centralize their system — a core application that allows county employees to view their messages, phone lists, and glance at the important work they need to do each day with links to all of the other apps to which each employee has access. Companies have diverse wants and requirements and no software platform can be ideal in such a condition. It is pointless to try to find a perfect off-the-shelf software app that fulfills all your business needs. The smart thing to do would be to adapt the application for your special needs, employee skill levels, budget, and other elements. For these reasons, do not rush and pay for well-publicized leading systems. Though these may be widely used, they may not be the best fit for your unique wants. Do your research, check out each short-listed application in detail, read a few Alpha Anywhere reviews, call the maker for explanations, and finally settle for the application that provides what you want. How Much Does Alpha Anywhere Cost? We realize that when you make a decision to buy IT Development Software it’s important not only to see how experts evaluate it in their reviews, but also to find out if the real people and companies that buy it are actually satisfied with the product. That’s why we’ve created our behavior-based Customer Satisfaction Algorithm™ that gathers customer reviews, comments and Alpha Anywhere reviews across a wide range of social media sites. The data is then presented in an easy to digest form showing how many people had positive and negative experience with Alpha Anywhere. With that information at hand you should be equipped to make an informed buying decision that you won’t regret. What are Alpha Anywhere pricing details? What integrations are available for Alpha Anywhere? If you need more information about Alpha Anywhere or you simply have a question let us know what you need and we’ll forward your request directly to the vendor.